Light and fluffy gloves are perfect for fun non-competitive sparring. 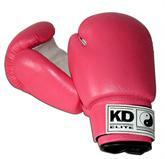 We recommend the KD Elite boxing gloves and youth boxing gloves. For serious training, a thinner gloves with denser padding should be used. The thinner padding will create a truer transfer of force and will minimize deflection and potential wrist injury.